The BPD is designed for processing all kinds of lamp waste, electrical devices, mercury button cell batteries, thermometers in addition to heavy mercury contaminated wastes with a higher content of organic substances such as mercury zinc batteries, dental amalgam, medical wastes, sludge and wastes from the military and chemical industry. The process is fully automatic which makes it extremely safe, and removes the risk of human error. All essential functional parameters such as pressure, temperature and process time are adjusted to conform to the waste treated. This enables optimum efficiency. 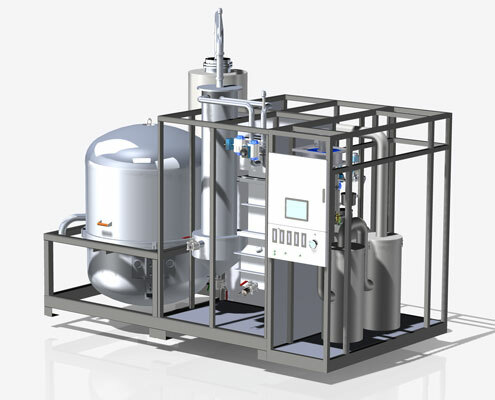 Through higher capacity the new BPD 1000 will allow users to increase batch size significantly. The increase in efficiency will have positive effect on profitability. The increase in size will also allow users to cater to new segments of Mercury extraction as bigger fractions/elements can be processed. Let us show you how the Mercury Distiller Concept works – take a look at our Youtube channel och download the video.